Bizzare Creations - the studio that developed the game - was acquired by Activision in 2007, and subsequently put to sleep in 2011. During their tenure with the media behemoth, very little was done with the series. There was a sequel for the Xbox 360 and a spinoff for the Wii, and that was pretty much it. But now we finally have a proper new entry in the «Geometry Wars»-saga, courtesy of Lucid Games, an independent development studio salvaged from the dismantled husk of Bizzare Creations, consisting of many members from the team that made «Geometry Wars: Retro Evolved 2», although lacking Stephen Cakebread, the game's original designer. «Geometry Wars 3: Dimensions» is a twin-stick shooter with plenty of chaos and hectic action, and unlike its predecessors - which exclusively used 2D vectors - the game has now been fully brought into the third dimension. As a result the game's visuals now look like a cross between «Super Stardust HD», the arcade-classic «Tempest» and the movie «Tron» projected through a lava lamp. It has a lower entry threshold than previous iterations, as you are no longer flung head first into audiovisual pandemonium. The game now features an "adventure mode" which gradually introduces the game's mechanics in portions of increasing challenge and complexity, and where you earn stars based on how well you perform in a given level, «Super Mario»-style. You can also boost your arsenal with optional upgrades that are introduced by winning boss fights and collecting stars. These weapons can further be bolstered by feeding them with Geomes which are small green squares left behind by vanquished enemies. Geomes also function as point multipliers when you pick them up, and are thus key to reaching higher scores. 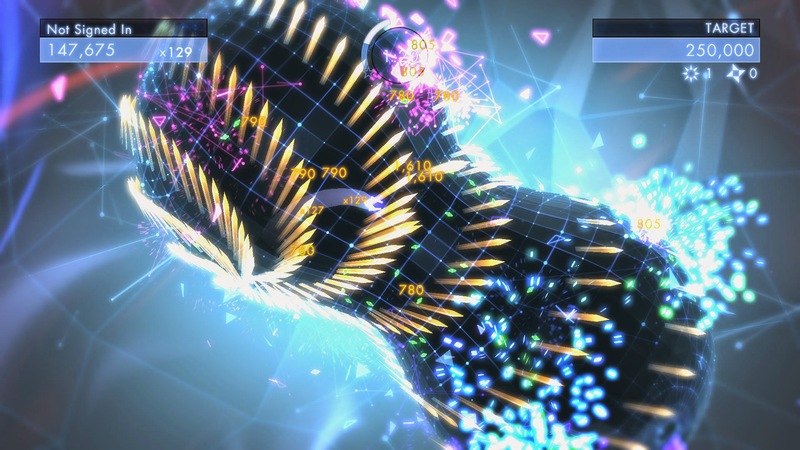 And «Geometry Wars 3: Dimensions» is really all about score. Kind of like the days when arcade machines were found at local watering holes and pizza parlors, and it was considered cool to score high enough on games so you could write your initials (or an obscenity) at the top of the high-score list. 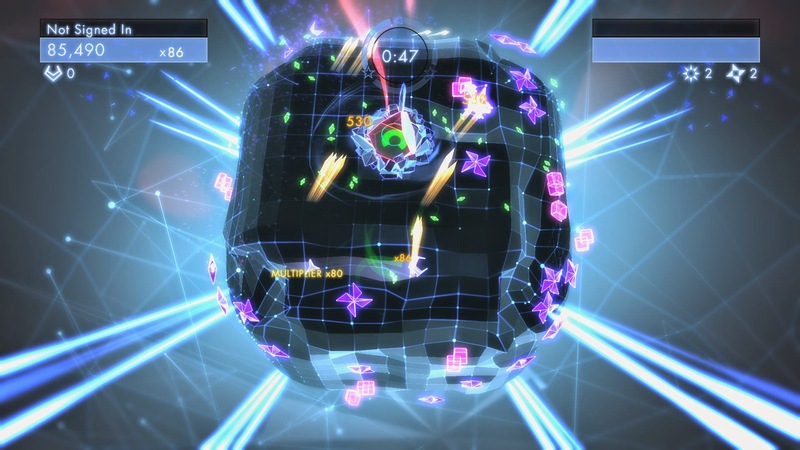 «Geometry Wars 3: Dimensions» accomplishes this with online leaderboards, where you can compare scores with the rest of the world or just the people from your friend list, both for individual levels in the adventure mode, and for each of the many alternative variations of the game included in the package. And this is where «Geometry Wars 3» brings the proverbial extra dimension to the table: Variation. In addition to playing the numerous and well designed levels of the adventure mode repeatedly in the hunt for a bigger score, there are lots of extra modes with alternative rules of engagement, both for solo play and multiplayer. 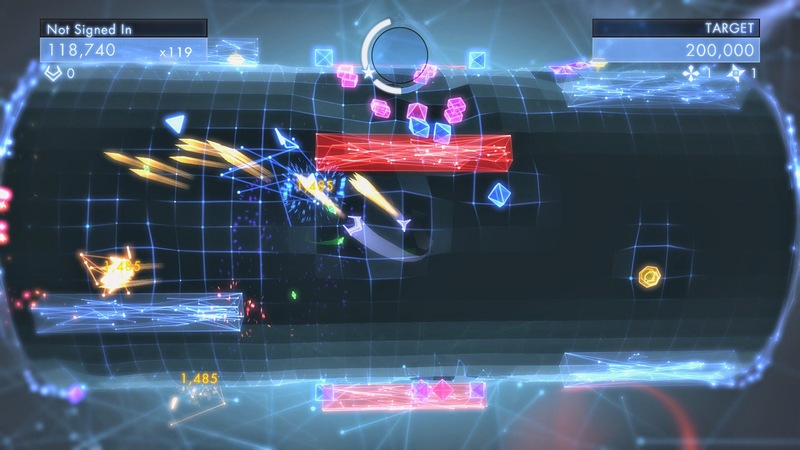 These modes primarily represent classic content from earlier games in the series, where we can find variations like King where you can only fire from dedicated zones, Pacifist where you can't fire at all, and Evolved which is essentially the first «Geometry Wars» remade with the new engine. It's not possible to use upgraded weapons in the classic modes, which is a good thing, as it prohibits players who grind for upgrades from having an unfair scoring advantage over those who choose not to. Sonically, the game has also been expanded beyond its predecessors. «Geometry Wars 3: Dimensions» has more tunes which are all suitably Amiga-MOD-inspired, sprinkled with sound effects and dialog that sounds like it has been sampled from a Commodore 64 speech synthesizer. «It isn’t a game for consoles, it’s a game for gamepads». But even though the visuals have been upgraded, it's not always for the better. For instance, a particular type of enemy - so called wormholes - which in the original were distinctive, colourful, maelstroms of gravity, has in the new version been reduced to kind-of-dull-looking single coloured twisters. Not only do they look less cool, but the 3D model also obscures the playing field, making it more difficult to separate danger from background. The amount of moving objects on screen is also reduced compared to the original, and as such the almost overwhelming complexity from its predecessors is never quite there. But the awesomeness still is. It just manifests in a slightly different fashion. Usually in the form of adrenaline-spiked paranoia, brought on by having to navigate tiny, often claustrophobic arenas where enemies can hide on the other side of a 3D surface, but still be less than a second away from crashing into your ship. 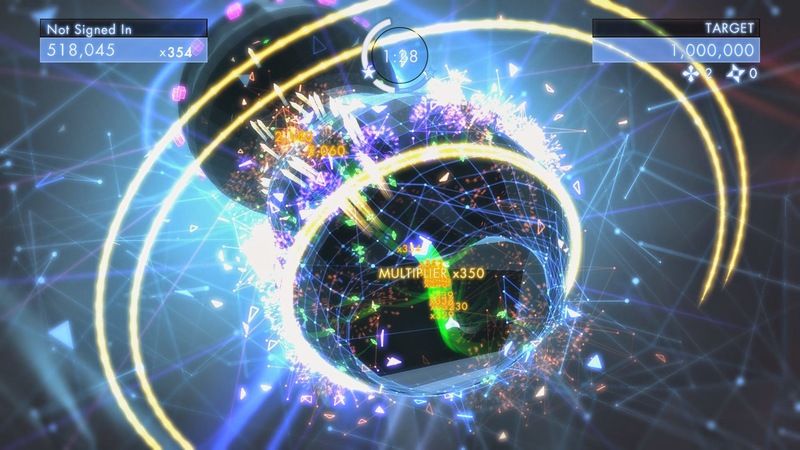 Ultimately «Geometry Wars 3: Dimensions» is neither better nor worse than its predecessors. It's just different. I therefore consider it more as a supplement than a replacement. Personally I will likely still keep playing the original «Geometry Wars: Retro Evolved» for many years to come, because it's part of my music listening routine, where I like to take in the complexity and colours whilst listening to psychedelia or synth-pop instead of the in-game soundtrack. «Geometry Wars 3: Dimensions» is however a game which deserves to be experienced as an audiovisual experience purely on its own terms, without too many external distractions. I would also advice to limit the playtime to short sessions, as this is one of the games that can actually make you dizzy.